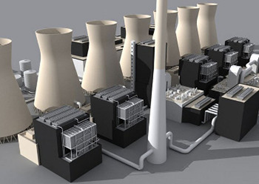 The Gadani Power Park (simulated pictured) was to include ten power plants with a capacity of 660 MW each at Gadani in Balochistan. The plants were supposed to run on imported coal. According to initial reports, the projects were meant to finance by different companies. Chinese investors financing six of the projects, two by Dubai-based construction firm ANC Holdings, one by the Pakistani government and one by a Turkish investor, Nurol Group. Pakistan Power Park Management Company was to develop, maintain and operate the infrastructure for the project, including a jetty to handle 20 million tons of imported coal, water supply, wastewater disposal, ash handling and elimination, cooling tower, switchyard, residential facilities and grid connection. The company received $9.86m in seed money from the government, while the Balochistan government contributed 5000 acres (2000 ha) of land. Chinese investors were set to provide technical and financial assistance after signing several memoranda of understanding. The projects were launched on a fast-track in July 2013, but Chinese investors withdraw in October 2014, allegedly calling the project unviable due to lack of existing infrastructure in the area. Pakistan has invited expressions of interest through its Private Power and Infrastructure Board (PPIB), but no new investors have stepped forward. Critics are calling the government's approach to the project inconsistent, with a change from public to private financing and conflicting discussions with several investors. Bureaucratic loopholes have also been noted, including allegations that the government wanted exemptions for the Chinese investors from procurement procedures and international competition. Contrarily, Chinese firms are building coal-fired power projects in another place in Pakistan, such as a scheduled 700 MW in Karachi, that is expected to be operational by 2018.